So my skin type has moved from being hormonal-crazy-puberty-oiliness to oily-combination, which basically just means that some parts of my face are oily, while others are normal or dry. My skin tends to get most oily in the 'Bermuda Triangle' area, as I've heard it called, which is just the area from the end of your nose and chin but in a triangular type shape. My forehead, even extending to my hairline is oily, and around my jaw line. Everywhere else is what I would classify as 'normal'. Every now and then I will get dry patches around those oily places, especially my chin/mouth area, which is horrid! So anyway, now you see what type of skin I have; a bit unruly and not very consistent. So if your skin is like this, my skin routine may just be the greatest thing ever for you, but maybe not. If you are really struggling to find skincare products that are right for you, why not give one or more of these a try? 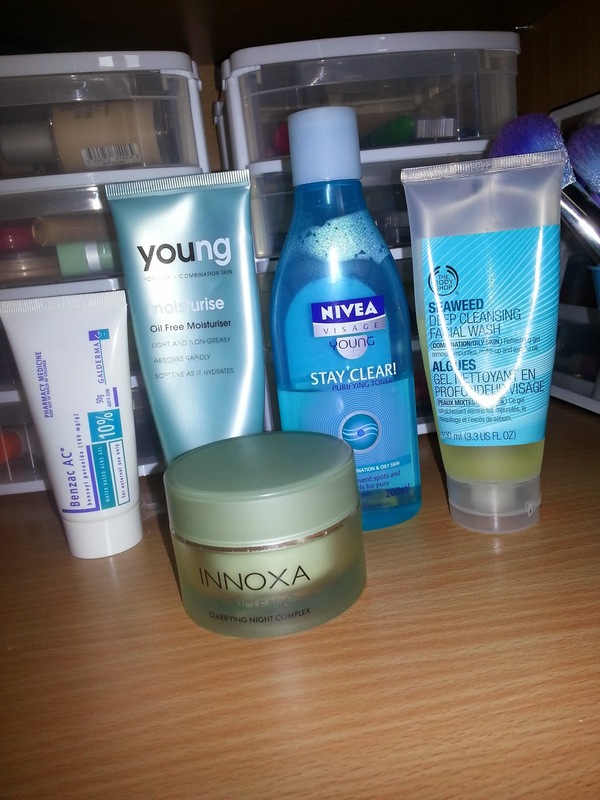 My everyday skincare routine has changed only recently, so I figured I would show you the old routine and the new one, because I know that many young girls and guys - like myself when I was 16ish - don't have all the money to spend on expensive face products. The old routine is a lot less expensive and most - if not all - the products are easily accessible (depending on what country you live in, of course), and the new routine is an upgrade I splurged on recently and is the ultimate best thing ever, but yes, much more expensive (I'll give RRP's for all the products listed (and if I can remember) how much I paid for them, because I'm the biggest bargain hunter ever. 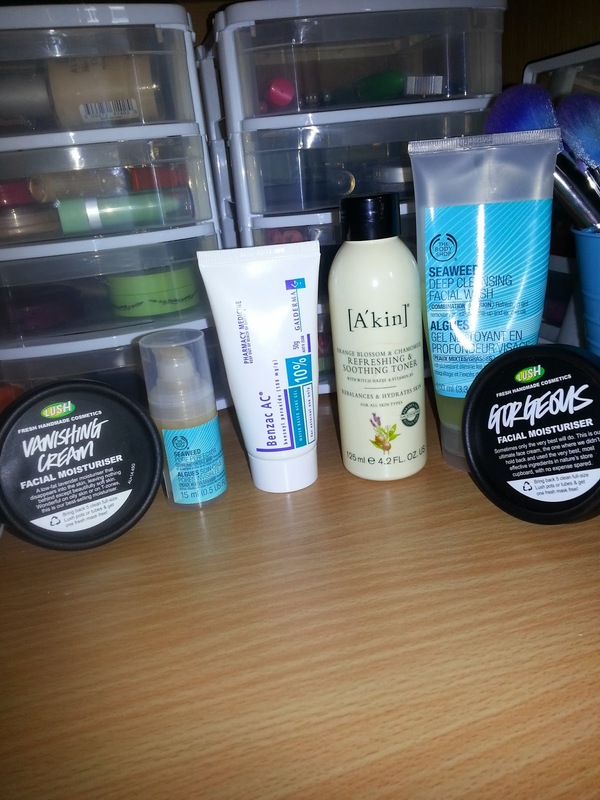 These products where part of my old routine (and some are still part of it now), and they are all great! On the far left is a pharmacy pimple cream Benzac AC which has 100mg/g of benzoyl peroxide; the stuff that dries out your skin to get rid of pimples. This is the 10% one, which is the strongest one in the range. If you are only just starting with using it, use the 2.5% solution first, then move onto the 5% before going to the 10%, otherwise you may find it could over-dry your skin, causing an over-production of oil. Next across is the Natio Young oil free moisturiser. It says it 'absorbs rapidly', 'softens as it hydrates' and is 'light and non-greasy'. Too true, my friendly packaging. For a product that is only $9.95 (http://www.natio.com.au/products/skincare-young) it certainly does the job it says it does. It's light and moisturising without the oily residue. It does, however, take a little bit to properly sink in, so leave it on for a bit before putting any makeup over the top. The tub in front was a huge skin savior for me. I always avoided moisturisers because of my oily skin, thinking that it would only make it worse. But with my Natio moisturiser and this, oh my gosh. It's the Innoxa Skin Clear Clarifying Night Complex. I was so lucky when I found this, as it was on clearance in Priceline for $5, when it's usually worth around $20 or more. Unfortunately I'm guessing that it's no longer available, as it's no longer in priceline and it's not even on the Innoxa website (http://www.innoxa.com.au/skin-care/skin-range/oily-~-combination). The stuff is great though. I used to put it on before I went to bed, and in the morning my skin just felt heavenly. It's so poopy that they don't have it any more! :( Wah! The next one is the Nivea Visage Young Stay Clear! 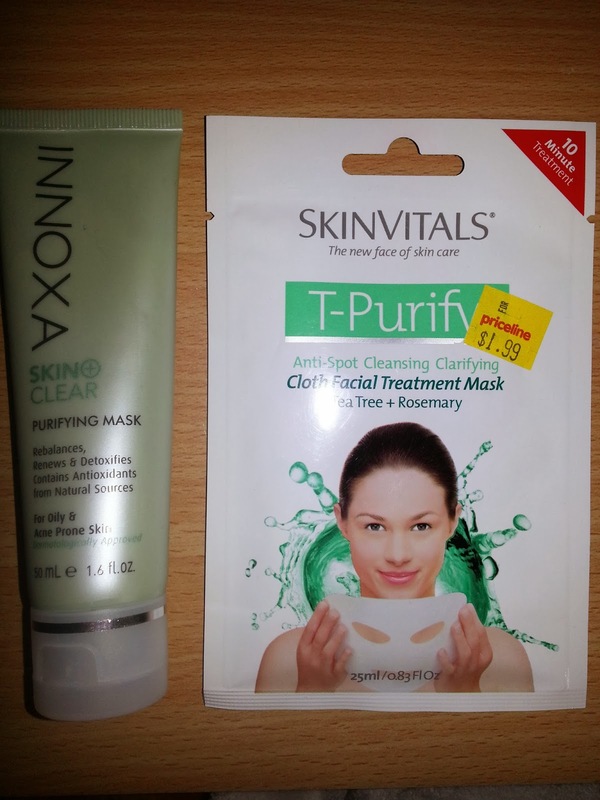 Purifying Toner. Pretty much just a standard toner really. It's the only toner I'd used up until last night, and it does the job. Just taking the last little bits of product build up and makeup and oil from your face before moisturising. I only used this at night (or morning if I was feeling particularly iffy), and yeah, it just...did its thing, really. The last thing is my favourite all-time use-this-forever face product, which is my Body Shop Seaweed Deeo Cleansing Facial Wash (or Algues Gel Nettoyant En Profondeur Visage, if you prefer reading the French bit). I literally actually remember using this face wash for the first time at my friend's house. I was hooked after that. It foams great in the shower (though not so well out of the shower) and gave my skin that tingly fresh feeling. Mmmmm! You know that feeling on your lips when you use a peppermint lip balm? Tingly fresh. That, but on your face. It feels like you've washed your face with ice cold water. I can't even find the right words to speak highly enough of this product. Get onto it. It's a little more pricey than say, a Garnier, Nivea or drugstore facewash, but it's worth it. It costs $18.95 (http://www.thebodyshop.com.au/SubCategory.aspx?Id=62&Page=2), which to be honest - for me at the time - was a little steep, but it lasts AGES and is worth every cent! My new skincare regime is a bit more moolah-out-the-window, but worth it. The ingredients listing is huge, but basically it's my dream daytime moisturiser. It sinks it wonderfully, has a nice smell (lavender) and leaves my skin perfect. Not dry, not tacky, not shiny. Perfect. This would be great for anything with oily skin. It does cost $39.95 per 45g pot, but don't worry, it will last ages, depending on how much you use. I personally just dab my finger print part of my pointer finger in and then use whatever sticks when it comes up. Absolutely fantastic stuff, I highly highly recommend this for any oily skin or combination skin! Next is my Body Shop Seaweed Pore Perfector. To be honest, I haven't noticed a real difference since using this, but I keep using it, just in case it takes a little bit to start working well. Basically it's supposed to make your pores appear smaller and help fight blemishes. I have big pores around my nose and the bottom part of my forehead, so I've been using it there, but as I said, no real results yet. I thought maybe there was, but I think I might of been seeing things, as the hopeful person I am. Again there is my pimple cream; fantastic stuff, and costs about $15 depending on where you get it from. Next is the new toner I picked up yesterday. It's the [A'kin] Orange Blossom and Chamomile Refreshing and Soothing Toner with Witch Hazel and Vitamin B5. So it says it 'rebalances and hydrates skin'. I've only used it once so far, but I actually noticed a good difference between this and the Nivea one. It smelt better (more fruity), made my skin felt less..umm...chemically worn, and felt more refreshing. I can't give the greatest review just yet, but my first impressions are good! I picked this up in Priceline for only $2 on clearance, but it is usually worth about $19.95 again depending on where you get it (http://www.purist.com/akin-face-care/toners). Again my Seaweed face wash; A.K.A my holy grail. And finally my LUSH Gorgeous face moisturiser. I use this one at night time, as it is much more rich. I figure that if my skin is combination, I need to both fight oiliness and hydrate well. So, fight oiliness in the day, and hydrate at night. This moisturiser is the greatest thing. Oh my. It IS expensive. Oh yes, it is. But the ingredients list is MASSIVE and a lot of the ingredients are cold pressed (which just means that you get the best out of the ingredient). It smells so fruity and floraly and sweet and just amazing. I put it on my skin and I am constantly trying to smell it. It is $74.95 (http://www.lush.com.au/shop/product/search&keyword=gorgeous), but I think it's worth it. I doubted that a few times, but when I thought about it, I'm only using it at night, so it's going to last AGES and it really does make my skin feel great. For oily skin, only use a small amount, as it is quite rich. For normal/dry skin, use more. Just use to your skin type. Once a week (sometimes twice) I give myself a sort of facial. This usually just entails a face mask along with my usually skin regime. These are sort of the main two I use. 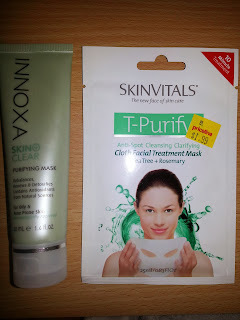 On the left is the Innoxa Skin Clear Purifying Mask, and I also really like the SkinVitals face mask range. The one here is best suited for oily skin: the T-Purify Anti-spot Cleansing Clarifying cloth facial treatment mask. It has tea-tree and rosemary in it. Tea tree is supposed to be really great for oil control and blemishes, and rosemary is a good skin tonic for cleansing. It also has eucalytpus extract which is to help sooth, refresh and cool the skin. Don't use face treatments or masks every day. They are a more intensive skin product that will over dry and over work your skin if used too often. I do love to use face masks in the bath though; SO relaxing! So there you go, my everyday skincare regime for my oily/combination skin. 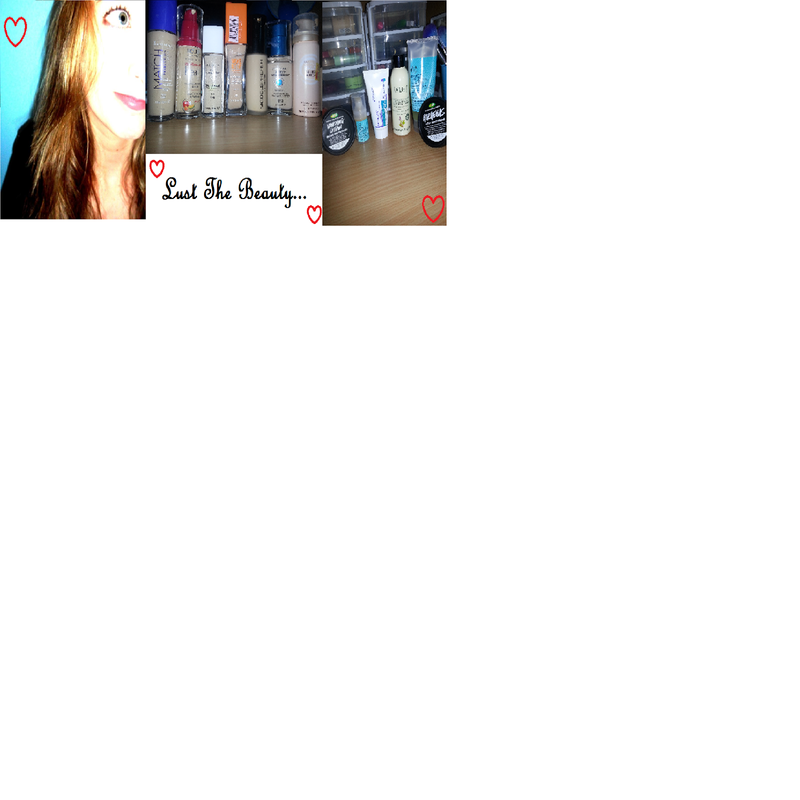 If you have any holy-grail face products you use that you think I should try, please comment them! I love trying new things and writing about them here! Till next time, stay clear!